After the Sharjah Masters 2019, UAE witnesses the start of another super strong event — the Dubai Open. This is the 21st edition, showing a long-standing tradition of organizing this high-quality tournament since the late 90s. Almost all of the top players in the world of chess have, at some point in their career, played at the Dubai Open! If you look at the above image carefully, you will spot a familiar face in the background. Yes, the young boy who is standing and watching the game is none other than Magnus Carlsen, who played the Dubai Open in 2004 and achieved his final GM norm! The tournament has begun with a total of 163 players from 35 countries. 80 players out of 163 playing at the event are from India. There are in all 31 GMs and 24 IMs taking part in this tournament. The players are fighting for the top prize of US$ 13,000. Le Quang Liem is the only participant above the Elo of 2700. Four rounds have been completed and Friday was a rest day. At the end of four rounds we have two leaders. 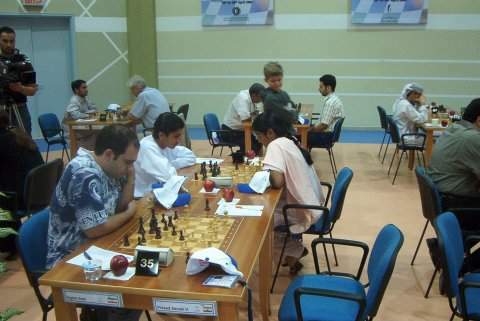 GM Aleksandar Indjic from Serbia and KS Raghunandan from India. While Indjic's performance is something we can expect from a 2592 GM, Raghunandan has been extremely impressive. With just a rating of 2370, he currently has a performance of well over 3000 Elo! Raghunandan KS started as the 56th seed, yet after four rounds he is the leader of the event with four victories. From rounds two to four he has defeated three grandmasters — GM Ahmed Adly, GM Vahap Sanal and GM Alan Pichot. Here are all the three games played by Raghunandan. What is interesting to note, is that all of the games that he played have been fist fights, and in all of them he has come out victorious. While the top board clash in round five between Raghunandan and Indjic promises to be interesting, we have 11 players on 3½/4 waiting for the leaders to slip up, so that they can claim the driver's seat. The chasing pack includes Maxim Matlakov, Uzbek talent Nodirbek Abdusattorov, Spanish GM Miguel Santos, Ukrainian former talent Yuriy Kuzubov, trying to become the first GM of Malaysia Yeoh Li Tian, fresh from an excellent performance at Sharjah Masters Shamsiddin Vokhidov, top seed Le Quang Liem, Algerian GM Bilel Bellahcene, top Indian GM Sethuraman SP and Argentinian GM Sandro Mareco. On the rest day, the traditional Dubai Blitz event was held. Players usually enjoy playing the blitz because an entire day has been specially dedicated for this event. As a result, you can see many of the top GMs taking part. The tournament is conducted smoothly without any delays and glitches and ends in four hours. This year the event was won by GM Mikheil Mchedlishvili of Georgia.